Perfect water view setting with this Grandview Point Condo! Heron Bay is located on the 21 Mile Marker by water. NON-Smoking Walk in level. A comfortable queen size bed is in the bedroom with a queen-sized pull-out couch for guests or kids. Microwave, TV/Cable, and gas grill on the lakeside balcony with a main channel view. 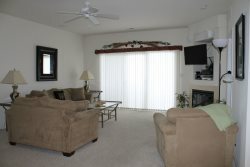 Very fun and accessible complex in the Heart of Osage Beach! Enjoy all the nearby restaurants and attractions. This complex is only 10 minutes away from shopping, or drive just 5 minutes and enjoy one of the great local golf courses. Complex offers Pool and tennis courts.